The Pulpit Rock Conservation area is “Bedford’s Natural Treasure” and one of the town’s best places for local hiking, bird watching, and close-to-home outdoor experiences. 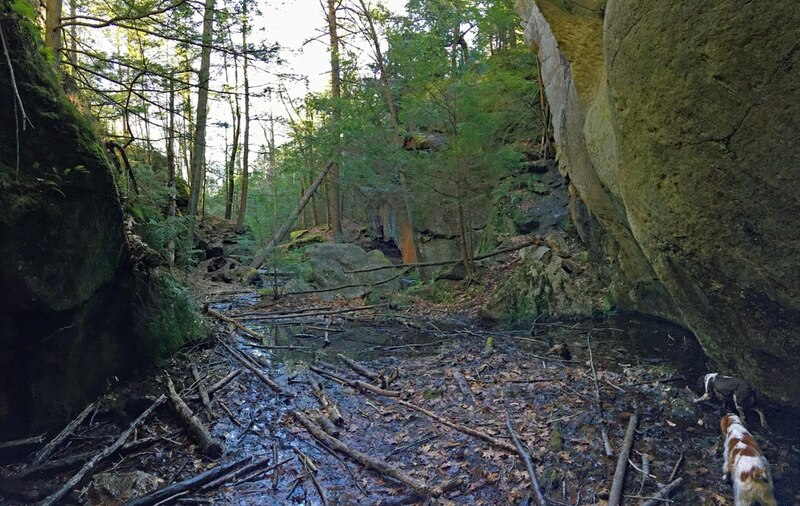 With varied terrain, the 338-acre parcel features the gorge and ledge named “Pulpit Rock”, wetlands, Pulpit Brook, a number of small picturesque waterfalls; rocky outcroppings, glacial erratics such as Indian Rock, beaver lodges, and the remnants of Gage’s Mill, along with forest and fauna. The Pulpit was formed some 14,000 years ago by glacial runoff, according to geologist Richard Moore. Melt water containing swirling boulders and other sediment wore through the bedrock and produced a plunge basin and significant ledge resembling a church pulpit – now called Pulpit Rock. In the early 20th century the Pulpit was a privately owned tourist attraction. A carriage road brought visitors for sightseeing excursions. Picnics and dancing took placed at a pavilion near the Pulpit. A staircase and boardwalks allowed visitors to inspect the unique rock formation. All the man-made improvements were reportedly destroyed by the Hurricane of 1938. In 1965 the newly formed Bedford Conservation Commission outlined goals for the protection and utilization of the Pulpit Rock area, and on March 8, 1982 the town acquired 143.6 acres of land there. Since that time additional land has been added through purchase or donation making this conservation land now 338 acres in size. On May 21, 2013 after more than two years of complicated title research and easement drafting, especially on the part of past BLT Chairs Bob Jones and Ruth Tolf-Ansell, BLT Attorney John Monson, members of the Bedford Conservation Commission, the Pulpit Rock Subcommittee and Town Planner Karin Elmer, the town granted a conservation easement on the Pulpit Rock Conservation Land to the Bedford Land Trust which will ensure that this land is preserved in perpetuity. While restrictions already exist against future development in various deeds connected to the area, the conservation easement now held by the BLT will act as an overlay, giving a uniform and consistent layer of protection for the land that is enjoyed by so many for various recreational purposes, such as hiking and snowshoeing. Under the terms of the easement, the BLT will monitor the property boundaries to be sure that the property remains protected from development and encroachment. 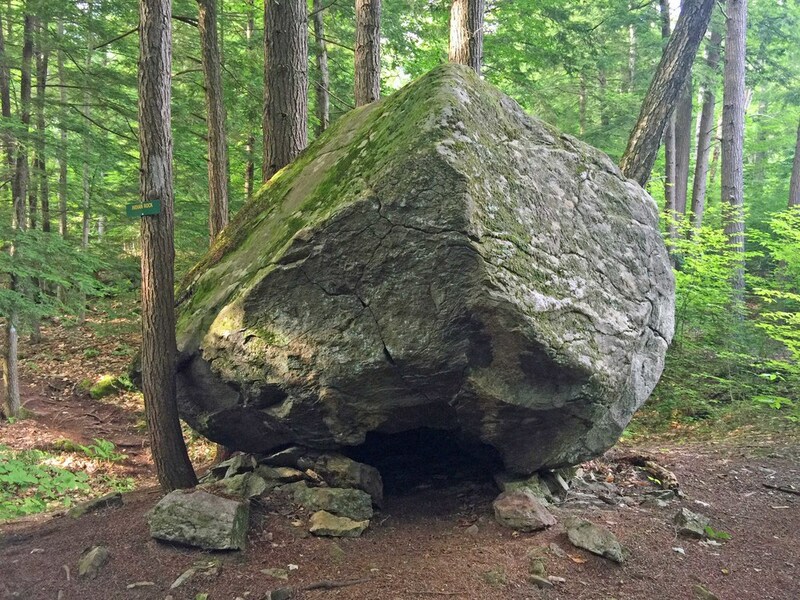 The maintenance, improvements and day-to-day monitoring of the trails will continue to be done by members of the Conservation Commission's Pulpit Rock Conservation Subcommittee, also a group of volunteers. The Pulpit is a natural treasure not only because of its geology and history, but also because of its open space and natural habitat. Mixed stands of hardwood, pine and hemlock cover much of the property. The wetlands forming the headwaters of the Pulpit cascade over small picturesque waterfalls leading toward the vast rock formation. This conservation land offers more than 3 miles of hiking trails and other opportunities for passive recreation. The Pulpit Rock property also abuts Amherst conservation land which then abuts the Joppa Hill conservation land. A new connector trail runs from Pulpit Rock through Amherst to Joppa Hill. 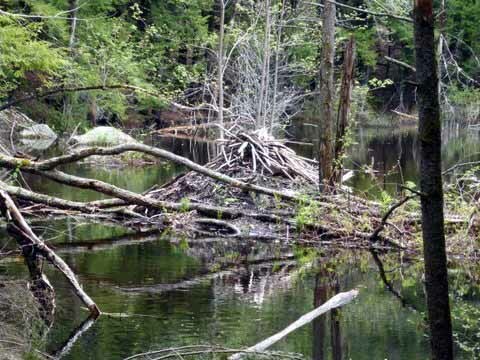 The three properties combined create a meaningful conservation area for wildlife and recreation. Currently we are campaigning to permanently endow the stewardship of the Pulpit Rock Conservation Land. Click here for more information about the Pulpit Rock Stewardship Campaign. Welcome to Pulpit Rock Conservation Area! Did someone ask where to find BLT donation envelopes? Glad you asked! You'll find them at both parking areas. Indian Rock - occasionally home to a porcupine! View from the top of the Pulpit - don't get too close to the edge! Don't forget to bring the dog!